We were told that dolphins would normally be sighted within 30-45 minutes after leaving the Canibol or Capiñahan Wharves at Bais town in Negros Oriental. That’s if you leave Bais early morning. Unfortunately we left at well past 10AM. And here we were already one hour away from Bais, in the middle of the Tañon Strait and closer to the island of Cebu than to Negros Oriental. And still no dolphins in sight. We were beginning to feel resigned to spending major bucks for a big boat designed for 25 people (there were just six of us on the boat) but ending up with zero dolphin sightings. Suddenly our dolphin spotter shouted and pointed to a single pod of leaping dolphins not too far way. Then another. And another. Soon as many as 20 dolphins were circling or swimming alongside our sea craft. A pair of dolphins at the Tañon Strait. We’ve never seen these many dolphins at one time in the wild so we became excited and began clapping thinking we were getting the dolphins to perform. Many people believe dolphins are naturally friendly with humans and that the acrobatics they often perform in their presence – as we were now experiencing – are a kind of show-off and their way of seeking contact with people. But although there have been many documented encounters where dolphins sought contact with people, these dolphins are wild animals who were just following their inquisitive instincts. No matter. We were enjoying the athletic displays these loveable creatures were dishing out. A pod of leaping dolphins; dolphins are social animals. 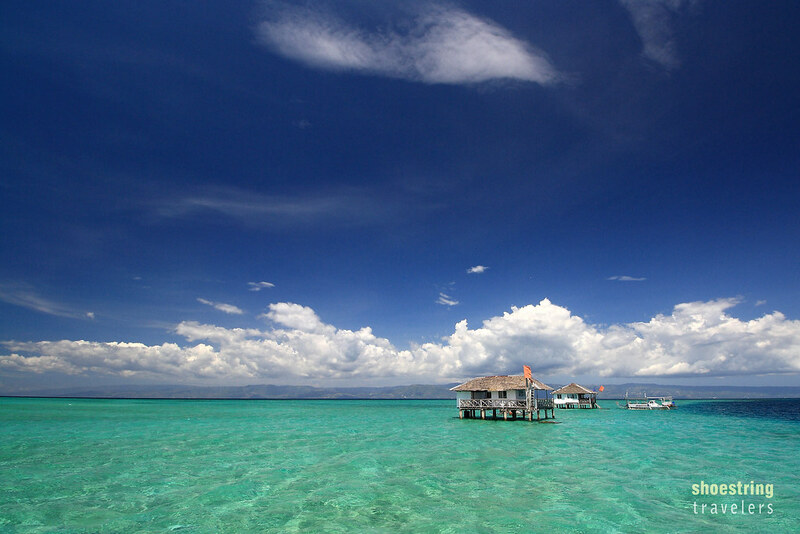 The Tañon Strait is that body of water that separates Negros Island from the island of Cebu. There’s a lot of observable marine life in the area including whale sharks in Oslob, Cebu. Off Bais town spinner dolphins – named for the twisting motion their bodies make when they leap out of the water – are usually sighted in the morning hours especially during the months of April and May. We should have been here at 8AM since dolphin sightings usually occur between 8 and 10AM. But we were late coming from Dumaguete City and ended up at well past 10 AM at the Canibol Wharf in Bais. To be able to still observe as many dolphins as we saw was indeed a blessing. For all the commotion the dolphins were making however, we noticed that none were performing those towering leaps out of the water that we often see in photos and videos or even those dolphin shows at Sea World in San Diego. Our boatmen replied that these dolphins perform those aerial feats very early in the morning – around 6AM; those acrobatics taper off as morning progresses. Dolphins are social animals who travel and hunt for food in groups called pods which consists of up to 12 individuals. It seems that once you sight a pod here at Tañon Strait your boat can simply stay put at a location and other groups of dolphins will congregate at the spot. We must have spent more than 30 minutes watching the spinner dolphins and could have easily spent another 30 minutes more but our stomachs began to grumble as lunch hour approached. That was when we decided to head back in the direction of Bais and towards our docking station for lunch: the Manjuyod Sandbar. We’ve actually passed by the Manjuyod Sandbar on the way to the middle of the Tañon Strait; the sandbar is just 15 minutes away from the Canibol Wharf. Stretching seven kilometers long from the tip of north Bais Bay, the white sandbar was fully submerged by the time we got there. High tide! We had failed to anticipate that the tide would have been at its apex at mid-day, thus totally inundating the sandbar. Just like our dolphin encounter, we found out that we had to be here very early in the morning if we wanted to see the exposed white sand of Manjuyod. The Manjuyod Sandbar at high tide. 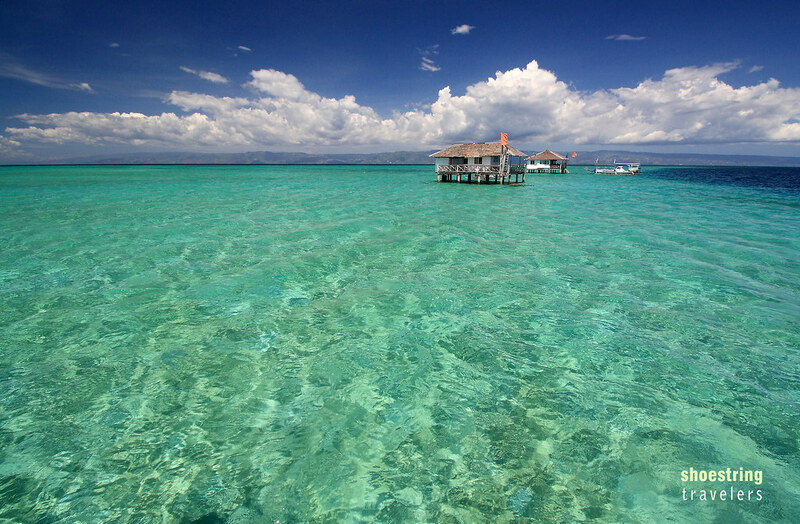 With its crystal-clear turquoise waters stretching well over the horizon however, the Manjuyod Sandbar, even when totally submerged, is still a sight to behold. Our boat dropped anchor at a selected spot not too far from a cluster of four cottages and we were soon taking our lunch. A soft breeze blowing amidst the heat of the noonday sun cooled our bodies and added to the tranquility of the beautiful surroundings. Soon several in our group were gently lulled to sleep. Huts for rent at Manjuyod. We had originally intended to explore Manjuyod on foot, not anticipating the extent of the tides. Now we could only do so by swimming and snorkeling. By the time we proceeded to do so the water was almost six feet deep at its shallowest. Since there were no corals in the vicinity there wasn’t really a lot of colorful marine life to observe but we did see schools of numerous tiny fish swirling maddeningly around our boat. After another hour of rest we decided to end our Bais and Tañon Strait adventure and head back to town to catch the bus back to Dumaguete. On our ride back to Dumaguete we realized how fortunate we had been. We had arrived so late at Bais that the probability of seeing the dolphins was very small. Our boatmen would not give up, however, and it was to their credit that we ended up enjoying our Bais tour. They also doubled up as cooks for lunch, grilling panga ng tuna or tuna jaw that was so good it even surpassed what we later tasted at an established restaurant at Dumaguete. It’s people you encounter like these that make traveling worthwhile. High tide at Manjuyod; the Negros mainland in the background. At Bais town proper get on a trike to either the Capiñahan Wharf (at South Bais Bay) or the Canibol Wharf (at North Bais Bay). Capiñahan Wharf is where the local government-operated boats and the Bais City Tourism office are located while private boats operate from Canibol. In our case we simply asked our trike driver to take us to the dolphin-watching boats and he promptly motored us to Canibol Wharf. Boat prices in both of these wharves can range anywhere from P3,000 to P5,000. The boat referred by the trike driver had a seating capacity of 25 or more. The operator was charging us P5,000 but we managed to haggle it down to P3,500 by dispensing with the usual trip to the Talabong Mangrove Park. The boat had no passengers earlier that morning and was probably only doing its best to get a trip for the day, hence the big discount. The boats will take you to the middle of the Tañon Strait for dolphin-watching, then bring you to the Manjuyod Sandbar. It is best to be at Canibol Wharf very early in the morning – our boatmen said doing the trip at 6AM will usually guarantee a sighting of spinner dolphins doing their aerial acrobatics, something we failed to see since we arrived in the middle of Tañon Strait at almost 11AM. We were actually fortunate to observe several pods of dolphins; the probability of seeing these mammals after 10AM decreases sharply. Tide-permitting, the boats can also take you to the Talabong Mangrove Park, a 400-hectare protected sanctuary, a trip which we had to forego because of our haggling. You can also ask the boat to stop at certain spots for snorkeling. Bais City tourism officials encourage dolphin watchers to book ahead of time particularly during the peak months of April and May, something which we did not do but were still fortunate enough to get a boat. The city government boats are available for booking at telephone numbers: 63 (35) 402-8174, 63 (35) 402-8040 and 63 (35) 402-8180. Bais tourism personnel can also assist travelers headed for Capiñahan Wharf and help them buy food supplies at the Bais public market. Posted in Negros OrientalTagged Bais, beach, central visayas, dolphins, islands, nature, negros oriental, outdoors, philippines, sandbars, travelBookmark the permalink. The Philippines is such an amazing place. I can’t wait to visit my parents next month. Welcome back! I see you’ve been to El Nido – a place I’ve been planning to visit for ages but never had so far.